PAUL JAY: Welcome back to the next segment of our interviews with Naomi Klein. Naomi, we saw this tremendous explosion of celebration at the Olympics, fireworks and such, and as close to, perhaps, a Big Brother society as one could imagine. And then we see this sort of image of millions and millions of people marching into consumer paradise, led by a benign leadership—you worry about consuming; we will worry about the politics. But if it's all so harmonious, just why are there so many cameras and so much security? 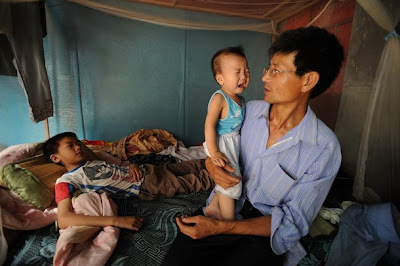 So talk a little bit about the real state of conflict in China. And why is there such a security apparatus? NAOMI KLEIN: Well, the Chinese leadership is incredibly worried about unrest. That's the emphasis on harmony is a response to the fact that this has become an enormously unequal society. And it's a very precarious political situation, because you do still have a political leadership that pays lip service to the idea of equality, and it calls itself a communist party. So it is a very precarious situation. 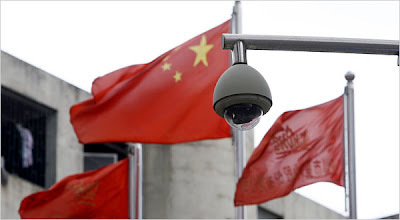 Now, surveillance has always been a huge part of the communist system in China, of people keeping under control. But as China has transitioned into this booming capitalist economy, it has had to displace millions and millions of people. A hundred and thirty million Chinese people are classified as migrants, migrant workers, which means that they had chosen to leave their rural communities to look for work in cities like Shenzhen or Guangzhou, or they were forced to leave because their community was just leveled by the state and turned into a new shopping mall, a new highway. So this presents a challenge for social control, because when people are living and rooted in their community, then you have all the usual party structures that keep an eye on you. There's the old lady down the street who's actually keeping track of the last time somebody had their period, and whether or not they're adhering to the one-child policy or not. I mean, it's that level of nosiness. But that level of nosiness requires knowledge of your neighbor. It requires that sort of gossip that is so familiar. KLEIN: Buy-in, yeah, but also it does require kind of a tight-knit community and a culture of snitching. The fact that there are 130 million people roaming China looking for work has broken down that system of social control and snitching, because when you are an economic migrant and you're going to a new city, nobody knows you and nobody can keep an eye on you. So replacing this system of snitching has been a technological upgrade, where the Chinese regime has embraced all of the technologies of the so-called war on terror, like biometric identification, facial recognition software embedded in network CCTV cameras. And all of this is very familiar, because we're seeing it in Dulles Airport. We're seeing it in the streets of London, where we're seeing it with the increased use of GPS. So all of these technologies have been normalized in the post-September 11 context. KLEIN: There is a regulation. After the Tienanmen Square Massacre, Congress made it illegal for US companies to sell police equipment or technology to China, any equipment that could be used for policing, because the police in China were seen as a repressive force, and there was no way of knowing whether, you know, you could sell them fingerprinting technology, and that could be used to fingerprint student demonstrators and send them into the gulags. So that's why the laws were on the books. What's interesting is that at the time—this was 1990—they came up with a list of all of the possible police equipment, and that list really hasn't been kept up to date. So all of these very high-tech sort of post-9/11 technologies are slipping in, really, through loopholes. It's not clear at all that it is legal, but one example, which I found when I was researching this in China recently, was that on the list you have fingerprinting technology—you cannot sell it to China. But L-1, which is a very large Homeland Security contractor in the United States, has been selling to Chinese companies facial recognition software, which is the ability to make a print of someone's face and run it through surveillance cameras. Now, that was in the realm of sci-fi in 1989 when the Tienanmen Square Massacre happened. And so it's sort of traveling through this loophole. But I think it's quite deliberate that that loophole has been allowed to stay as open as it has. The Olympics has been the mother of all loopholes, and that's because in the name of Olympics security, in the name of securing the games for international VIPs like George Bush, in the name of making it safe for international athletes, in the name of fighting terrorism, all of this equipment has been flooding in with seemingly no regulation at all. KLEIN: Well, this is the new disaster-capitalism trough. You know, Iraq was the trough for awhile. The Department of Homeland Security has been a pretty good trough. Building Fortress Europe has been a good trough. And what I mean by public money that is just transferred to private corporations in the name of fighting an endless war on terror. And we see it in this feeding frenzy around the world. The Green Zone is sort of, maybe, the epicenter of this feeding frenzy. But China is the new trough, because basically what the government in Beijing has said is, "We will spend whatever it takes to secure our country, and we want the latest technology and the best toys." So, you know, I interviewed an executive in Guangzhou, who works for one of the big security contractors, named Abell Technology, and he said, you know, "London is so dated. London is ten years ago. We are the future." Right? And, you know, they see themselves as really wanting—the Chinese government really wants to show that when it comes to surveillance, just like it comes to everything else, they are ahead of the West. So they are saying, "We're not doing anything different than London is doing with their cameras, and we're not doing anything different than George Bush is doing with his Patriot Act, but we're going to do it more and we're going to do it better, because we're China and we do everything better. JAY:In the next segment of our interview, let's explore further why there are such intense levels of security in China. Please join us for the next segment of our interview with Naomi Klein.